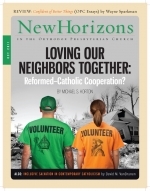 Loving Our Neighbors Together: Reformed-Catholic Cooperation? Woman to Woman: Where Shall I Go? On a host of doctrinal and practical concerns, the challenge often is to avoid the extreme either of confusing things that should be distinguished or separating things that should be held together. Although debates between Rome and the Reformation involve many interlocking issues, the doctrine of salvation has always been center stage. Usually this focuses upon the question of how a person is saved. Is one justified by faith in Christ alone, for example, or by faith and works together? But closely connected with how a person is saved is the question of who may be saved.